Well good work and congrats on your first scene in blender! Just a few things that first strike me when I look at this image is the water coming out of the tap - it shouldn’t be so “controlled” or “cylindrical”. Also the scene is a little dark… perhaps if you play around with the lights and see how you go. Anyway thats my thoughts on the subject but good work on your first scene! Great, I like the idea! Turtle bath! For your first scene you used many new things: particles, fluids. The grass isnt bad, but looks too uniform. Also usually it doesnt grow so close to walls, because there is a little of concrete around buildings. The turtle needs some textures, this one is plastic, so learn about UV mapping. 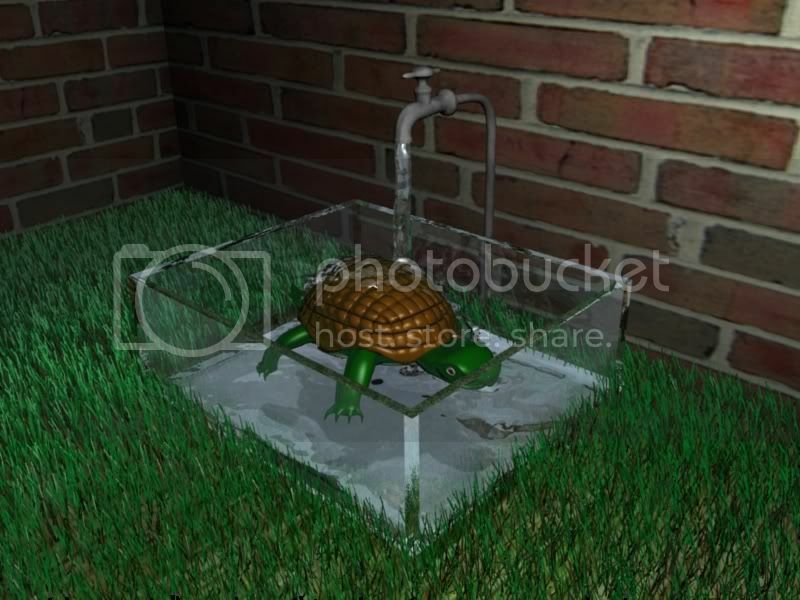 Why is the turtle levitating? Light definetely need work. There is Ambient Occlusion, try to enable it. For the first scene this is very good. Keep it up. One thing that hasn’t been mentioned is that the scale on the bricks from one wall to the other is off. The wall on the left looks nice, but the one on the right the bricks are too large. And in the corner you should put a piece of trim to smooth the transition from one wall to the next. The grass strands should be thicker, and tapered slightly too, (shading>materials>links and pipeline>strands) That way the ground wouldn’t show through so much. But for a first render, this is really good! Keep it up. for posting your thoughts… ill have a loook at uv mapping. have no i dea what it is but lol.